The last time Miguel Cotto fought live on HBO’s flagship station in June ‘15, it turned out to be the 3rd highest-rated fight of the year. Saturday’s ring return for Puerto Rico’s first-ever four division world champion merely produced the third highest-rated boxing telecast of the evening. 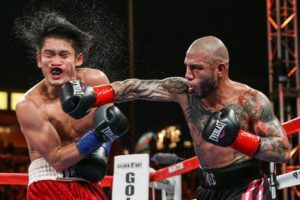 Cotto’s rousing 12-round win over Yoshihiro Kamegai attracted an audience of just 730,000 viewers on a very busy Saturday evening of boxing. The bout peaked at 805,000 viewers, with both numbers paling in comparison to Cotto’s last two live appearances on HBO—a 4th round knockout of Daniel Geale in June ’15, which averaged 1.589 million viewers for the third most-watched cable boxing match of the year; and a 3rd round stoppage of Delvin Rodriguez in Oct. ’13, drawing 1.555 million viewers in the most watched cable boxing telecast of 2013. Unfortunately for the Puerto Rican superstar, commanding an audience for his first fight in 21 months—since a Nov. ’15 World middleweight championship title losing effort to Saul ‘Canelo’ Alvarez—as going to be a much tougher battle on the dial than in the ring. All eyes were on the circus at T-Mobile Arena in Las Vegas, with Floyd Mayweather making a celebrated ring-return of his own with a 10th round knockout of UFC superstar and boxing debutant Conor McGregor. Pay-per-view sales won’t be released for another week or so (if at all), but figure to do no worse than 3 million buys, with some speculating it can even threaten the all-time mark of 4.6 million units sold set by Mayweather in his 12-round over Manny Pacquiao in May ’15. Also easily edging Cotto in the ratings battle on the evening was a Mayweather-McGregor undercard lead-in show airing live on Fox. The featured bout of the evening—late replacement Yordenis Ugas outpointing fringe welterweight Thomas Dulorme—drew well north of 2.4 million viewers, also performing above average in the coveted 18-49 market compared to past Fox telecasts in that time slot. It was mission accomplished on every level for Mayweather, whose timing of the event was deliberate with the intention of disrupting major business in place for Golden Boy Promotions. In addition to going head-to-head with Cotto’s ring return on HBO, the PPV event also dominated the headlines and commanded the overwhelming majority of media attention. The latter meant very little focus on the year’s most anticipated matchup between Alvarez and Gennady Golovkin, which takes place in the very same venue in three weeks, topping a September 16 HBO PPV telecast. While industry chatter surrounding Canelo-Golovkin has begun to pick up, the majority of boxing headlines are still being dedicated to what took place this past Saturday in Las Vegas. Whatever attention is—or isn’t—going toward September 16, even less has been paid to Cotto’s first pro appearance in California, an unfortunate scenario for a superstar who has spent his career carrying his boxing rich Puerto Rico island on his back for more than a decade. Instead, he returns to one of his lowest-rated bouts among the 23 times he’s been prominently showcased on HBO’s airwaves. Perhaps a grander stage will come of what Cotto insists will be the final bout of his incredible pro career, targeting December 2 as last call. The co-feature saw Rey Vargas outpointing Ronny Rios over 12 rounds for the first defense of his super bantamweight title. The lead-in attraction drew an audience of 524,000 viewers on average; peaking at 687,000 viewers. Both boxers appeared live on HBO for the first time in their respective careers. All aforementioned data provided by Nielsen Media Research.